They got engaged in Santorini in 2016, when Vivek popped the question on a cliff overlooking the stunning Santorini Bay. He had arranged a romantic sunset dinner for that evening, a meal the pair both remember fondly. They both moved over to Dubai together soon after. 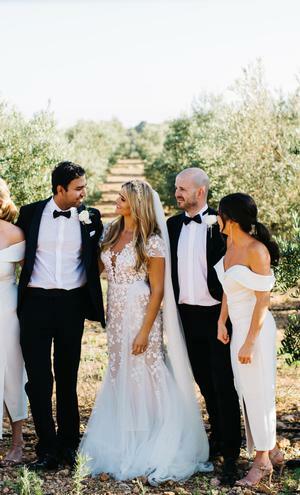 The couple travelled to sunny Spain to tie the knot, with guests flying in from all over the world to celebrate the occasion. "We wanted to throw a party they would never forget," says Jasmine, "and we had decided on a destination wedding from the start, as we both loved the idea of getting to spend a few days with our family and friends rather than just one!" The wedding marked the first time Vivek's family from India met Jasmine's family from Ireland, and the longer celebrations meant that they could really get to know each other. They planned a three day event, beginning with a welcome drinks party in Es Baluard in Palma, Mallorca, on the Wednesday evening. 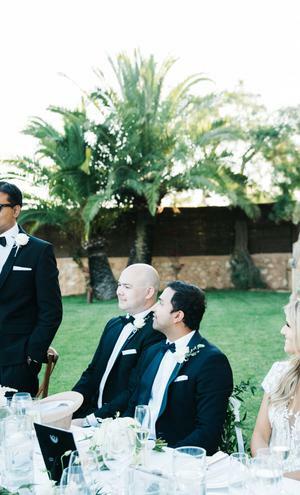 Their dreamy outdoor wedding took place in the fabulous Finca Son Mir on the Friday and the day after, the couple rented a villa to throw a pool party where guests tucked in to paella as they chatted about the previous night's festivities. Their wedding photos are by Amelia Fullarton. Working in PR, bride Jasmine has organised her fair share of events over the years but she says, "nothing compares to your own wedding". 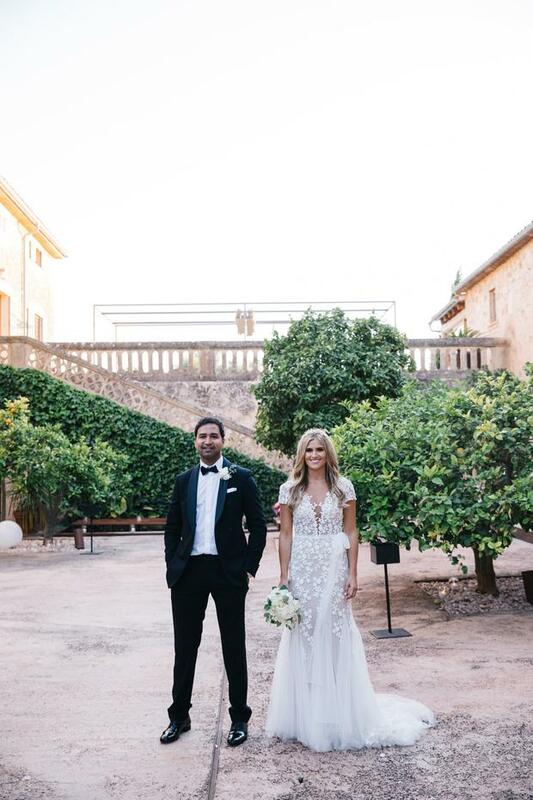 Living in Dubai and planning a wedding in Mallorca was a challenge for the couple but Jasmine admits she spent hours at it, and enjoyed every minute. "Admittedly spent hours deliberating over every decision," she says, "from the colour and style of our flowers, to the lighting, venue décor, props, bridesmaid dresses, cake, music, readings, guest transport and everything in between." 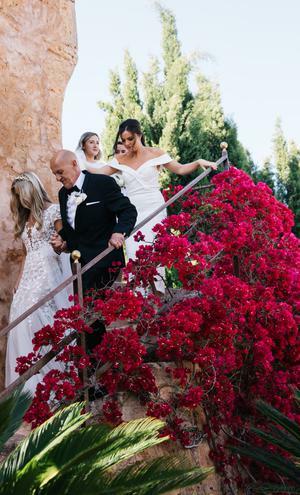 Jasmine's mother kept her well stocked with ideas from all the latest bridal magazines, while she took to Pinterest to get some inspiration for the look for the day. 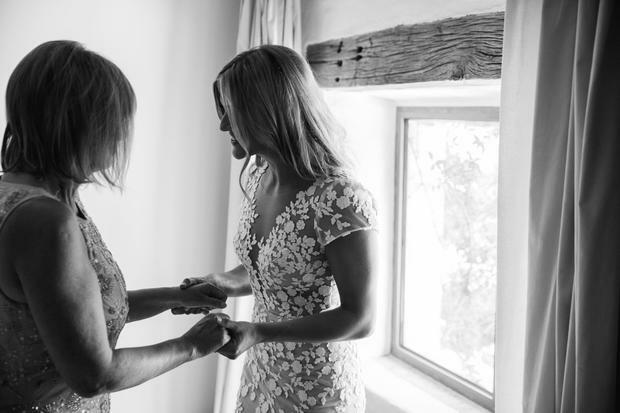 Her mother was "a godsend" through the planning, she says, styling her for her civil ceremony, finding the bridesmaid and flower girl dresses and accompanying the couple to their various appointments with suppliers. 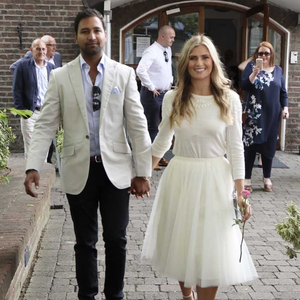 For her civil ceremony in Dublin, Jasmine wore a beautiful Jenny Yoo white tulle skirt and cashmere sweater, which she got from Covet in Dublin's Powerscourt Centre while for the big day in Spain, she went with a very different look. "As one of the most indecisive people in the world, it was a shock to myself and my family that I decided on the dress so quickly, but it’s true what they say – when you know, you know." Jasmine found her Liz Martinez gown in The White Gallery in Newry, after flying home to Ireland for one week exactly one year before the wedding. The gown was custom made in Paris, and Jasmine accessorised it with a headpiece by Luna Bea and had her veil custom-made to match. "I felt so incredibly lucky to get to wear something so beautiful and so special on my wedding day," says Jasmine. "I can’t recommend Rachel and the White Gallery enough. She has an amazing eye and is the exclusive stockist of all of the designers in her store. Every single gown was stunning. [My wedding dress] is currently hanging on the front of my wardrobe and I don’t think I’ll ever be able to part with it." The bridesmaids wore beautiful gowns by Australia designer White Runway, while Jasmine's sister and junior bridesmaid wore a gown by Quiz. Jasmine and Vivek had a humanist ceremony with celebrant Annie Verinder which included readings and poems said by close family and friends. The bride walked up the aisle to Elbow's One Dy Like This played on spanish guitar by Toni Cruz. They had a 'wine box' ceremony within their ceremony where letters they had written to each other ahead of the wedding were nailed inside a wine box to be opened on their 10th wedding anniversary. 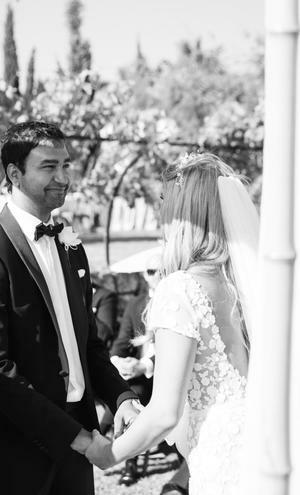 "Our celebrant was fantastic and made sure our ceremony was completely personalised and very ‘us’," says Jasmine. "The whole ceremony was beautiful and very emotional." 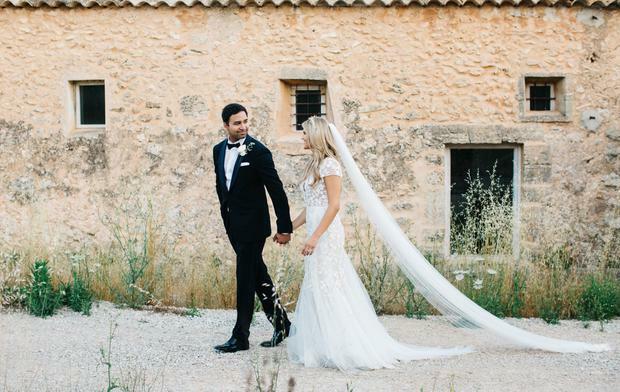 The couple tied the knot in the Finca Son Mir after falling in love with the area on a recce to Mallorca after they had gotten engaged. "We see 4 different venues. They were all incredible which made the decision pretty hard! But there was something very special about Finca Son Mir and we fell in love with it instantly. It’s also an olive farm and the Finca is surrounded by lush greenery and olive fields. 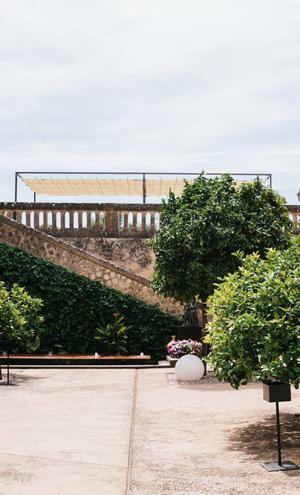 "It had rooms on site for us to stay on the night of the wedding, and we also knew that the caterer at Finca Son Mir was Marc Fosh - a highly renowned chef who we had heard incredible things about. He did not disappoint. The food was out of this world and it was something all of our guests remarked on." 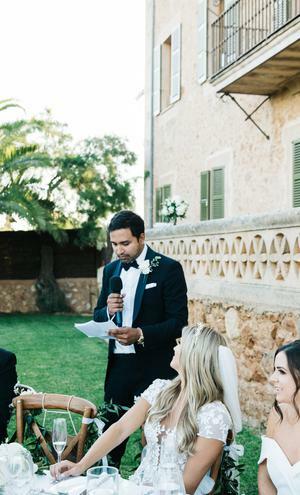 The couple's beautiful outdoor ceremony in the Finca Son Mir, Camí Vell de Sineu, Mallorca took place at 6pm in the evening when the sun was low in the sky and temperatures made for a more comfortable setting. The space was filled with natural greenery, leaving the couple with very little to do to make it a romantic backdrop for their vows. Guests were given parasols and trilby hats to shelter from the sun, and the couple had bathroom baskets with everything anyone could need for the day - including flip flops for dancing in later in the night! They opted for a four-poster pergola for the ceremony, which was draped in white chiffon cloth, white flowers and pale green foliage. They also had olive foliage with white peonies as pew ends and fresh cream rose petals sprinkled on the grass to create the aisle. They had 'his' and 'her' signs on their chairs, which they sourced online at Etsy. For dinner, the couple had a long banqueting table as their top table, decorated in green garland and white flowers in vases. The guests’ tables were decorated with low pedestals in gold with a mix of white and cream roses and peonies, white astilbe, white Esianthus and eucalyptus. Jasmine said help from family was key to pulling the day together: "We were very lucky to also get lots of support from my step dad, who’s happens to be a very talented designer. He created our wedding invitations and stationary, and had everything printed for us ready to be transported to Mallorca. My family each took an extra bag or suitcase, to help us transport everything!" 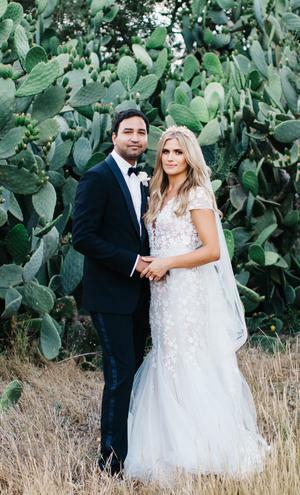 The couple's photographer was Australia based Amelia Fullarton, whom the bride came across by chance when searching online for some wedding dress inspiration. She spotted a stunning wedding in Italy on Harper's Bizarre, and fell in love with the photos. 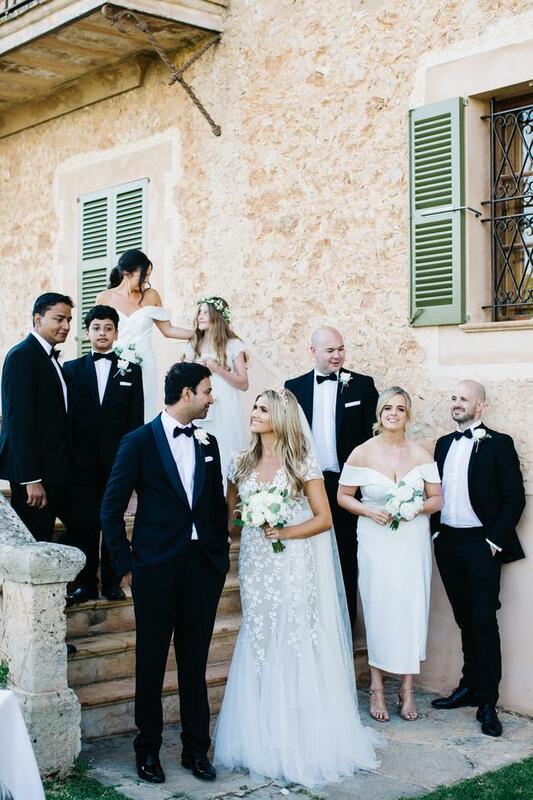 "Given that she’s based in Australia, I thought the chances of her realistically being able to shoot our wedding were slim to none, but thought I’d get in touch just in case – you never know after all" says Jasmine. Incredibly, Amelia was heading to Europe to shoot another wedding the week before Jasmine and Vivek's, and the couple were able to have her there after all. "She was amazing and captured such special moments that we’ll cherish forever." "When I was born, my grandmother had her wedding ring cut in half and then created two new bands – one for myself and one for my cousin" explains Jasmine. "My granny kept my ring safe for 28 years and gave it to me when I got engaged, which was such a lovely moment. My grandparents have been together all their lives and have one of the nicest love stories, so it felt extra special having her wedding band on our wedding day and I love that I get to wear it every day." 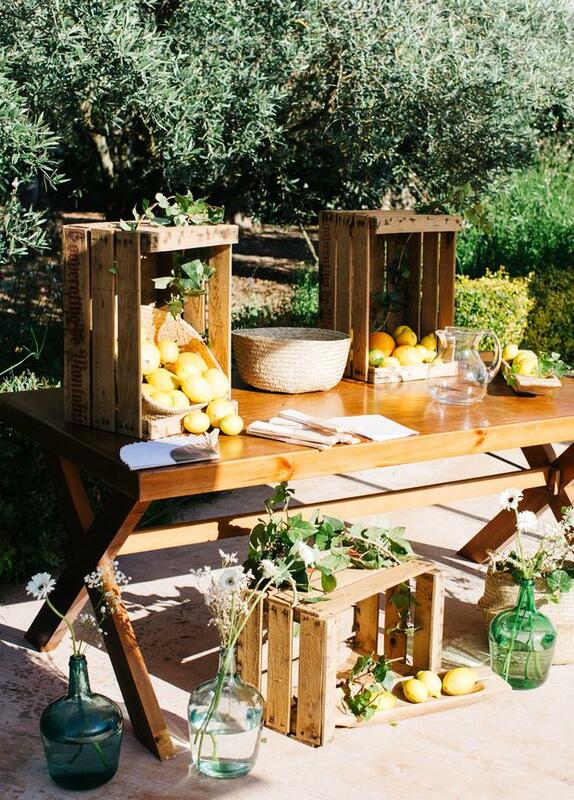 The couple had a lemonade stand and served before the ceremony, and after the ceremony, they had a cava and canapés reception, served alongside Aperol Spritz and 'Hugo' cocktails. "We created a fusion menu for the dinner, which meant we were able to cater to our different guests’ preferences," explains Jasmine. "Our family from India dined on Aloo Tikki Chenna, Shahi paneer and dal makhani, while the rest of the guests enjoyed Sea Bream to start, followed by Braised Iberian pork with an apricot-vanilla puree and warm, new potato salad. Desert was Cremoso of Coconut with banana ice cream and caramelised popcorn. From the canapes through to the dinner itself, we incorporated as many local dishes and produce as possible." "Walking up the aisle," says Jasmine. "The moment we saw each other for the first time was incredibly emotional and one of the stand-out moments for us both. And just seeing everyone we loved who had travelled from far and wide to be there, in one place, celebrating with us. It was the most special day and one neither of us will ever forget." "Try to organize the big things in advance, so you can enjoy the excitement in the run up to the big day," advises the bride. "Relax and enjoy the process – you will only do this once after all. Take time on the day with your new husband/wife to just take everything in, the day goes by so quickly so try to savour it as much as possible." And as for anything they'd do differently if they could do it all over again? "It would have been lovely to have a little more time on the day – because we started our ceremony at 6pm due to the heat. However, we had the best day ever and apart from this, there’s nothing either of us would have changed."